When expectations are high, you’re invariably up for some disappointment. Charles and Tom were unable to demo Rails-in-a-war-on-Glassfish; but at least they gave a warning in advance. But I definitely expected something more–or rather something else–from Eric Evans’ university session on domain-driven design (ddd). The afternoon session on scripting languages went well enough anyway–or at least, the JRuby part did. The session took off with a theoretical explanation of JSR-2something (the support for scripting languages in Java SE). After that, Charles and Tom got their chance to warm up the Java-minded public for all goodness of Ruby. It took a little while for them to get comfortable, but then Tom was at the keyboard showing the simplicity of building a small Rails app from scratch; and Charles got the flow of the presentation going, explaining what Tom was doing and going into JRuby details. The hour flew by for most of the audience. When I got back after the half our break, Charles and Tom were still answering questions. Now you have to believe me, in the 90 minutes of Groovy that followed, I did keep an open mind. I tried to look at the code samples objectively. I tried to admire the work that has gone into creating a dynamic variant of Java. I really tried hard to imagine a scenario where I would be tempted to remotely consider using Groovy in a real-world app. Okay, and I was also just a little bit busy trying to get my laptop to talk to the JavaPolis wireless network, which wasn’t easy either. But at least that one I finally succeeded at. The Groovy thing–I’m afraid it’s not for me. It gives me the worst of both worlds: no sweet Ruby syntax, and on top of that uglified Java syntax as well. Maybe next time I’ll see the light. I promise to keep an open mind. The thing that most disappointed me however, was Eric Evans’ morning session on domain-driven design. Not that it was a bad presentation, not at all. Maybe it’s all about expectations. I expected an introduction into ddd. What is it, what’s so great about it, why should we use it, what lessons have been learned, what tips can a ddd guru give us? Instead we got a session about domain modeling: how do we get from use case to domain model. And also, if we have multiple models within our application/organization, what patterns can we discern regarding the interfacing between those models and the teams that design them? Interesting enough, no problem there; but what does this have to do with ddd? Domain modeling like this can well be done without any domain-drivenness. Or can it? I’ll know more in a week or two, when Evans’ book that I ordered will arrive. To be honest, for my first visit to Javapolis, I was a little disappointed.. The session about DDD was a little chaotic.. Furthermore, Javapolis gave false information on their website.. They published that each javapolian would receive a coffee mug but I didn’t see it.. When I asked someone from the javapolis team, they didn’t have a clue what I was talking about..
Oh well, maybe next year it will be better..
I’ve seen coffee mugs being handed out at the entrance desk this morning (Tuesday); you must have missed that. How did you get your laptop to talk? I never seem to get any dns and so nothing works. Yes, the mugs were available this morning. Its my first JavaPolis and I’m really enjoying it. 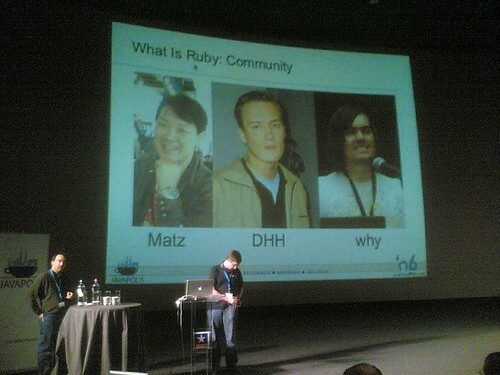 I was really interested in the JRuby talk by Charles and Tom. I must admit though, the three hour sessions are long, even with the break! Because of that we only received them on Tuesday… Mail me your address and I’ll make sure we ship a few JavaPolis mugs ASAP :o) You can contact me at sja at bejug dot org.